Today I welcome, Edward Finstein, The Wine Doctor. Edward Finstein is a renown wine writer, author, TV & Radio host, international wine judge, wine educator, lecturer, appraiser, consultant and tour guide. His first novel, Pinot Envy, is set in Napa Valley and is filled with deceit, blackmail, intrigue, murder and fun. Not a stretch for Napa! Giveaway: What's your favorite Pinot? Comment below to win a copy of Pinot Envy. One person will be chosen randomly. Be sure to leave a contact email. Allow me to introduce you to my alter ego, Mr. Woody Robins (I can hear shrinks the world over pulling out their note pads). Like myself, he’s a wine expert who teaches, consults, writes, judges, eats, drinks, loves, makes merry and has traveled the world over in pursuit of the nectar of the grape (It’s a dirty job, but someone has to do it). As a rule, Woody likes to work alone, but does enlist the help of his jealous girlfriend, dizzy boyhood chum, hip older aunt and long-time mate with the San Francisco police department. They certainly bring something to the table for him, but you see, Woody has a problem, or rather several. First of all he’s forgetful. Has to use a tape recorder to remember stuff. Even forgets where the tape recorder is sometimes! Secondly, he has a commitment phobia, much to the dismay of his girlfriend. Thirdly, he doesn’t like being treated the way his father treated him. So what else is new? He’s flawed and has baggage like the rest of us. Only goes to make him more vulnerable, real and easy to relate to! Perhaps most emphatically though, because of his dress, manner, and unorthodox investigatory methods, he stands out like a sore thumb and tends to draw attention to himself wherever he goes. He just can’t seem to blend into any situation no matter what and falls into mess after mess that he has to get himself out of, often with comic results. Not exactly the ideal cover for a sleuth to say the least! Wondering at this point whether he solves the case or not? Oh ye of little faith! Doubt not, our fair hero comes through with flying colors, even surprising himself. So why am I telling you all this? 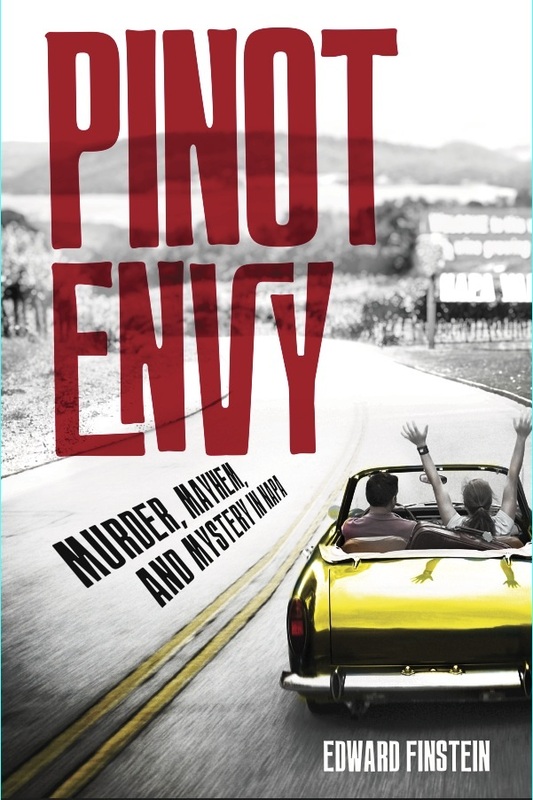 Because Mr. Robins has graciously agreed to allow yours truly, Edward Finstein (TV and Radio host as well), to document his incredible escapade in a new, comic, wine mystery novel called Pinot Envy, just released by Bancroft Press. It possesses much of the same kind of wit and humor that my last award winning, non-fiction wine book, Ask the Wine Doctor, displays. In fact, reviews of Pinot Envy have been extremely favorable thus far (www.winedoctor.ca/mybook.html) and numerous folks have commented that it would make a great feature film or made-for-TV movie. (Take that Sideways!) And guess what? Woody has relayed yet another wine-soaked, mysterious tale to me that I am busy documenting for future publication (More scribbled notes on pads by shrinks!). Are you ready for the title? It’s a good one… Mortal Zin. For more about Woody and me, like my Facebook page https://www.facebook.com/EdwardDocFinstein or follow me on Twitter @DrWineKnow. I guess my favorite Pinot would be Grigio. But sometimes Noir is tasty. One of our favorite pinots is Rodney Strong Russian Valley Pinot!